On Tuesday, the Texas bill (HB 2268) was sent to Gov. 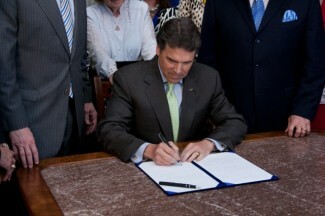 Perry’s desk, and he has until June 16, 2013 to sign it or veto it. If he does neither, it will pass automatically and take effect on September 1, 2013. The bill would give Texans more privacy over their inbox to shield against state-level snooping, but the bill would not protect against federal investigations. The bill passed both houses of the state legislature earlier this year without a single “nay” vote. This new bill, if signed, will make Texas law more privacy-conscious than the much-maligned 1986-era Electronic Communications Privacy Act (ECPA). With the ECPA, federal law enforcement agencies are only required to get a warrant to access recent e-mails before they are opened by the recipient. As we’ve noted many times before, there are no such provisions in federal law once the e-mail has been opened or if it has sat in an inbox, unopened, for 180 days. In March 2013, the Department of Justice acknowledged in a Congressional hearing that this distinction no longer makes sense and the DOJ would support revisions to ECPA. An authorized peace officer may require a provider of an electronic communications service or a provider of a remote computing service to disclose electronic customer data that is in electronic storage by obtaining a warrant under Section 5A. [A] district judge may issue a search warrant under this section for electronic customer data held in electronic storage, including the contents of and records and other information related to a wire communication or electronic communication held in electronic storage, by a provider of an electronic communications service or a provider of a remote computing service described by Subsection (h), regardless of whether the customer data is held at a location in this state or at a location in another state. An application made under this subsection must demonstrate probable cause for the issuance of the warrant and must be supported by the oath or affirmation of the authorized peace officer. Previously, Texas state law had language mirroring ECPA’s existing 180-day requirement. Of course, ECPA remains federal law of the land in Texas and in all the other 49 states. But civil libertarians and legal experts hope that this may spur Washington, DC into passing much-needed ECPA reform, which has languished for some time now. “Privacy is a special thing in Texas—it goes to the core values of Texas,” said Chris Soghoian, a senior policy analyst at the American Civil Liberties Union. Hanni Fakhoury, a staff attorney at the Electronic Frontier Foundation (EFF), agreed.